Polish-German rabbi; born in Ostrov, Poland, 1649; died at Constantinople 1719. His father was rabbi of Ostrov. In 1663 Naphtali was taken prisoner by the Tatars when they invaded Poland, but he managed to effect his escape. Soon afterward he took the place of his father as rabbi of Ostrov, and in 1690 he was invited to the rabbinate of Posen. Here he devoted himself to the study of Cabala; he attained such wide celebrity as a cabalist that many rich communities in Germany competed with one another for the distinction of having Naphtali as their rabbi. In 1704 he entered the rabbinate of Frankfort-on-the-Main. In 1711 the entire "Judenstrasse" was destroyed by a fire which broke out in his house, and Naphtali was accused of having set it on fire himself in order to test the validity of an amulet which he was said to have made and which was supposed to have the property of rendering objects inflammable. He was consequently imprisoned, and was released only after he had resigned his rabbinate. Naphtali then went to Prague. In 1714 he returned to his native town, and in 1715 went to Dresden to the court of the Polish king Augustus II., where he remained for some time. In 1719 he started, with his wife, for Palestine, but death overtook him in Constantinople. 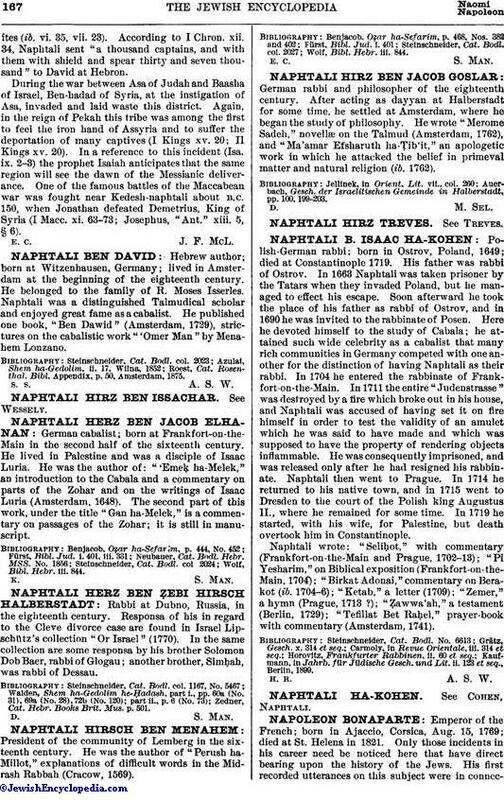 Naphtali wrote: "Seliḥot," with commentary (Frankfort-on-the-Main and Prague, 1702-13); "Pi Yesharim," on Biblical exposition (Frankfort-on-the-Main, 1704); "Birkat Adonai," commentary on Berakot (ib. 1704-6); "Ketab," a letter (1709); "Zemer," a hymn (Prague, 1713 ? ); "Ẓawwa'ah," a testament (Berlin, 1729); "Tefillat Bet Raḥel," prayer-book with commentary (Amsterdam, 1741). Kaufmann, in Jahrb. für Jüdische Gesch. und Lit. ii. 123 et seq., Berlin, 1899.